Digital wet oil paint sketch. wonderful!!! but where is the that "beauty spot" in his right cheek? it gives him some character, ain't it? I am kidding, ur drawing is very well done!! I did him some beauty operation and I expect to receive my paycheck!! ...oh, I didn't thought that he was so unsatisfied with it!!! great job...DOCTOR!!! Very good he looks a little evil very nice eyes, I keep waiting for him to breath. Do you remember Max in Cape fear? We look at the same character here! I think I saw the interview which he was being a very defensive as he didn't like the interviewer. But you are right a good actor like him takes moments from his life to roles and yes I think your right about cape fear he scared the life out of me! Max is one of the most vicious characters of American Cinema. May be his only potent rival is Dr. Hannibal Lecter! BOB'S BEEN TO THE DERMATOLOGIST!! He looks better than he ever has! This is superb. Even his trademark cockeyed gaze is captured. I quit. I'm gonna paint.....my garage. I like him very much. I saw many films of him. Among them, once upon a time In America is my most favorite. A grand movie. *Sigh* One of the greatest actors, honored wwith your ingenious portrait!! wow.... Shahin.... wanna know... dont u ever draw using pencil? I have many chalk and charcoal drawings. Go and look at my first posted work, a drawing of clack Gable and also look at my drawing of Gary Cooper. They are rendered by chalk and charcoal that is very close to pencil works. AWESOME! 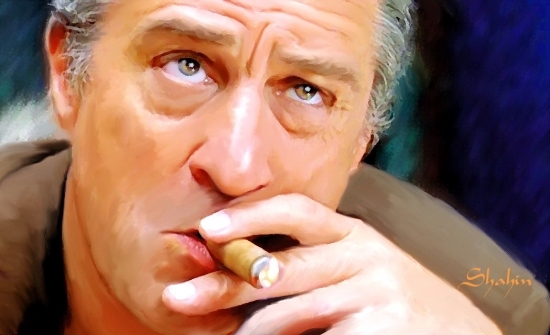 I LOVE DE NIRO!